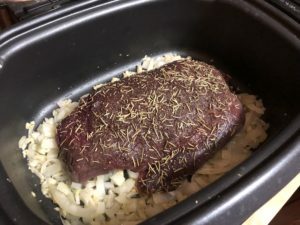 I’ve been making this roast for many years for band pot lucks and have been asked for the recipe several times. 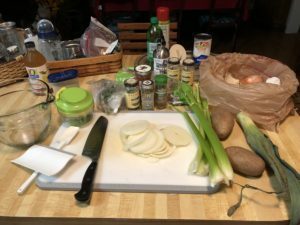 The recipe has changed a bit over the years and I try new things. I have had some fails, this recipe below is the best outcome over the years. When I made the roast I wrote down my measurements even though I usually don’t “measure”. 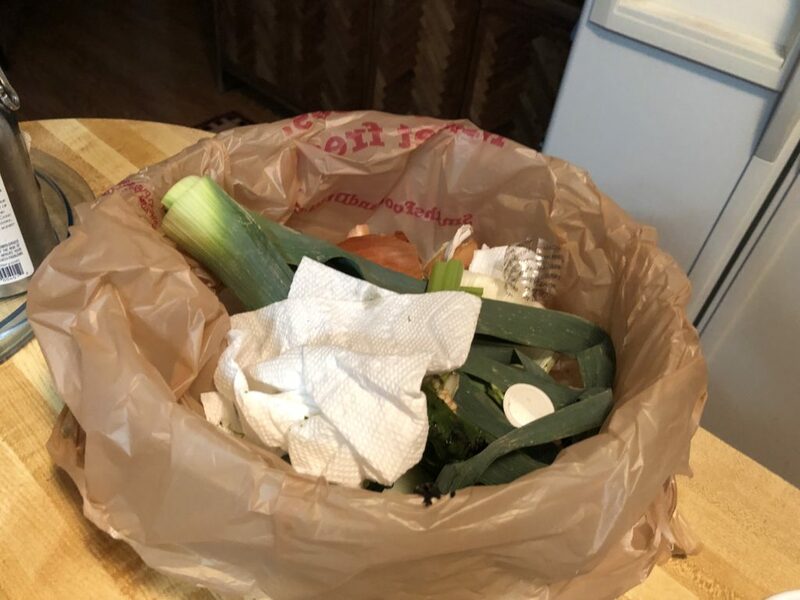 Tip: Put a grocery bag in a mixing bowl to collect scraps and ends, then tie off and throw away. Fail #1:One time I was making the roast for dinner at home, the housekeeper saw it was bubbling and thought she was doing me a favor by turning it down. The roast was not raw but it did not have that “fall apart” quality and did not taste as good. After that, if I have other people in the house, I put a note on my crock pot to leave on high or just tell guests not to turn it down. Fail #2: I have also burnt this roast before by not adding enough water because I asked someone to add water if needed and it didn’t happen. Having a little too much water tastes way better than dry and burned and makes for a happier dinner table. Fail #3: At a work pot luck a coworker unplugged the crock pot to make some toast then did not re-plug it in. 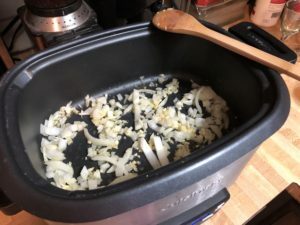 Since then when making anything in a slow cooker for an office pot luck I start it on high the night before then keep it on low while at the office…. and check on it often. Whenever I bring this to a pot luck, not only does the roast get picked clean the veggies left at the bottom (if any) usually go home with someone instead of in the garbage. This recipe is a favorite at potlucks. 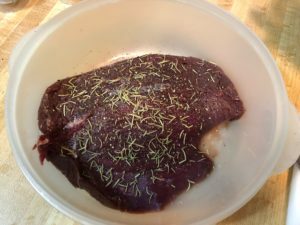 Any wild game can be substituted. Prep all the vegetables, keeping the garlic and half the onions separate. Save the canned tomatoes to add in with the liquids. 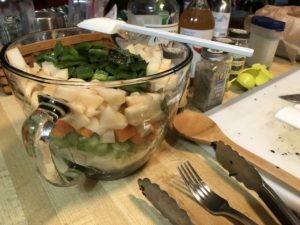 TIP: During camping season I mix up a batch of this veggies mix and freeze in a zip lock for use in dutch oven recipes. You can double up while making this recipe to save time later. Saute the onions and garlic in the olive oil until a little soft. I do this directly in the bottom of the crock pot. If your crock pot does not have this feature just skip it and add the garlic to the veggie mixture, and the olive oil in with the liquids. Place roast on top of the onion/garlic mixture. Sometimes I brown the roast but it does not seem to make a difference in the flavor or texture. Add the liquids, tomatoes, and herbs. Use enough water to half way cover the roast. Add the veggies and push around the roast. Add enough water so the liquids are even with the veggies. Cook the crap out of it! 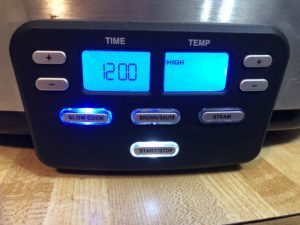 Set your crock to high and cook all day, 8 to 12 hours. If your crock pot is smaller you may want to check on the roast during your lunch hour and add liquids as needed. 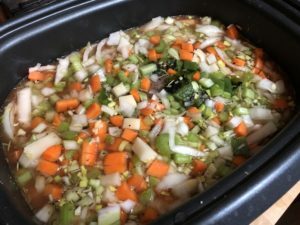 Give the veggies a little stir and turn crock to warm about a half hour before I need to put it in the car for travel to the party. Keep crock on warm at the pot luck. The apple cider vinegar does something to the texture of the meat so it does not turn weird after cooking it so long. You will not taste it in the finished roast. These photos do not show the tomatoes because I thought I had a can and did not. 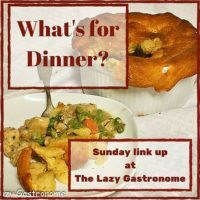 The roast still tasted great but I think it is better with tomatoes. If this is for a work pot luck you can start the roast before you go to bed. 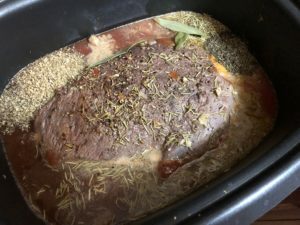 This entry was posted in Recipes and tagged crock pot, elk, pot luck, roast, slow cooker on March 24, 2019 by TetonTrekker. ♫♪ It's my blog and I'll change hateful comments to happy ones if I want to.